Located on the pristine shore of Cadiz, Spain, the Castle of San Sebastian is a beautiful fortress that you would love to visit if you are here. The serenity of La Caleta beach is such that you will be mesmerized for a lifetime. As this place is secluded from the main city, it is untouched by the human affair and so displays the wonderful architecture of the fortress and soothing sea at their natural form. The castle is said to be built in the year 1706. Inside the castle, according to the classical tradition, there was a temple of Kronos (a Titan of the Greek gods). 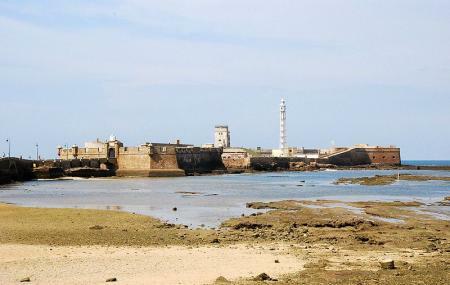 As you around the castle, you will find a lighthouse that was built during the Muslim period. It has an iron structure and is known as the second electricity powered lighthouse in Spain. Try the best Cadiz trip planner to visit this Castillo De San Sebastian as well as many others. Fine Accommodation options like Hotel Las Cortes De CÃÃƒÂ¡diz, Hotel Patagonia Sur and Hotel La Catedral will meet your requirement of where to stay in Cadiz. There are plenty of ready-to-book Cadiz vacation packages available that will cover the major attractions, accommodation concerns including the prime one like how to reach Cadiz. How popular is Castillo De San Sebastian? People normally club together Parroquia De Santa Angela De La Cruz Y San Antonio Abad and Museo Arqueologico while planning their visit to Castillo De San Sebastian. What an amazing place. A castle out in the Atlantic Ocean. I hung out on the beach and soaked up the afternoon sun and then walked out to the castle where the waves were crashing through the cracks in the rocks. It's a beautiful piece of history and worth taking a stroll to, especially at high tide or when the waves are big. The old coastal fortification is definitely worth a visit. The way to this fort is awesome. You walk on a narrow path into the open sea. The waves break on both sides of the path. Great view of the city and the vast coast of Cadiz. Would've been nice, however the place was closed, seemingly indefinitely. The walk down to it was very nice though. Maybe give a better rating if it ever reopens. Interesting and evocative. Worth a visit (it's free)!